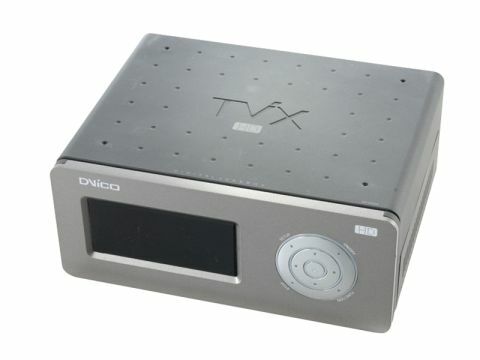 The updated version of the TVIX M-3000U now includes a digital HD output in the form of a DVI connection, but strangely, no HDMI. Connectivity is via wired Ethernet, although you can attach a wireless USB adaptor to the USB input. Its odd size is to accommodate a standard 3.5-inch hard drive, and depending on whether you buy the P or S versions, it'll take IDE or SATA hard drives. A VFD display provides basic information about the files that you're playing, and the remote has glow-in-the-dark buttons for operation in low light. You can either add media to the hard drive before you put it in the M4000, or you can transfer content by USB and FTP. Even with the latest firmware the FTP service is pretty flakey, so USB is your best bet. Two USB host ports enable you to attach memory sticks or external hard drives, but you can't copy content onto the internal drive from them. Setup and operation could be improved. For instance, to change source you press the number keys, whereas an input button would have been more useful. However, it runs virtually all media with aplomb, handling MPEG 1, 2 (great for ripped DVDs) and MPEG 4, using Divx and Xvid. There's no H.264 support, but you can set bookmarks on videos, enabling you to stop them and then come back to them later. One of its most interesting features is the ability to add an optional TV tuner, so that it can then act as a PVR, complete with Electronic Programme Guide. There's also basic server software supplied, enabling you to host content on a PC on your network, but sadly there's no UPnP support. Still, it's simple to use with bags of features and so is a great choice.